As we wrote in Revolutionary Perspectives 11 “the British state machine is confronted by a whole series of knotty problems – including the status of Gibraltar and the 'Overseas Territories' in the Caribbean”. In Gibraltar, “home” to much of Britain’s insurance industry and other financial institutions, the majority voted to remain in a Europe to which they are more than physically attached, but still don’t want to be part of Spain. No matter to the offshore finance industry which will thrive beyond all jurisdictions. 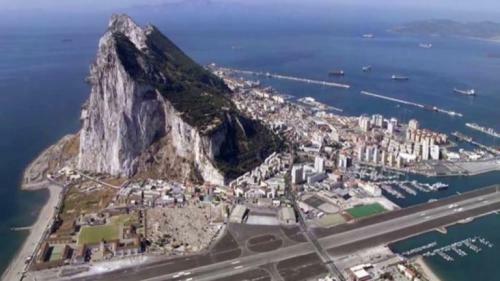 However after more than 300 years of British rule the “Rock” issue still provokes tensions with Europe as the following article from the Spanish blog Nuevo Curso explains. In Spain, two mistaken views tend to underestimate the "Gibraltar question". The first cannot escape the fetish into which pro-Franco propaganda and rancid nationalism have transformed the rock. The second reduces the conflict between governments to a routine friction between border states over the management of infrastructure and jobs linked to smuggling. But, since the Brexit negotiations began, what we have seen speaks to us of a very different reality. From the beginning, it has been a non-negotiable "red line" for the European Union. It is the only element of the negotiations that has provoked direct war threats and caused the British Government to raise support for the Catalan independence movement as "leverage". And the Spanish attempt to raise what the Foreign Minister calls “uncomfortable issues" has been accompanied almost immediately, and not by chance, by a crisis of a new kind: the effective loss of state control over the surrounding territory to drug trafficking. A military base that has come up short, a minuscule airport and the remnants of Spanish and British ultra-nationalism are not enough to explain the raising of imperialist tensions between the two states at this level. We must look elsewhere; at what the EU chose to ignore while Great Britain still had power and influence inside the EU, and at what the numerous Gibraltarian law firms claim to be the real local industry: "off shoring", the lucrative business of being a tax haven that contributes to the financial power of British capital and its political apparatus. With more than 15,000 virtual companies the Rock is a magnet for money laundering, the tax from which, would exceed for the Spanish state alone, 1 billion euros annually. That's not counting the 1.2 billion euros from cigarette smuggling, or what is in fact the lion's share: all the funds belonging to non-Spanish residents for which there is only a rough estimate. Here’s a clue as to why Gibraltar is so attractive: it does not tax foreigners who invest their money there, it only sells legal services and virtual addresses ... and despite that, its GDP per capita is almost double that of the region that surrounds it. Gibraltar is just one of many other British colonies and dependencies forming part of a large network that attracts the proceeds of crime from international criminal gangs, as well as huge sums of “legitimate” money which reluctant tax payers are trying to shield from their respective governments. The real "casus belli" is the maintenance of Gibraltar as a tax haven after Brexit. But let's not delude ourselves. The EU and Spain do not stand for probity and honesty in all this. Everyone is well aware of the fact that corruption and the need for "off shoring" are a normal part of the capitalist system. No one wants to do away with it. If that were the case, the draft Brexit agreement that deals with everything concerning Gibraltar and the relationship between the City of London and the European financial markets would not have been entrusted to Luxembourg, the Franco-German Gibraltar. Anarchy in the UK('s most famous fortress): comradeship and cupidity in Gibraltar and neighbouring Spain, 1890-1902.